I had an emotional attachment with a street dog whom I passively adopted. She was horribly abused by people because of her skin disease. 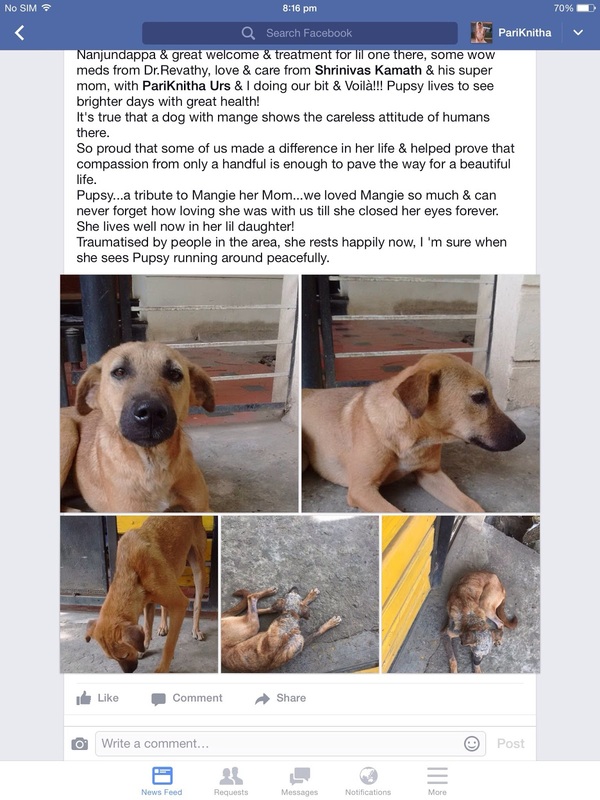 She was one of the ugliest dog on this earth, we called her lovingly ‘Mangie’ because she was suffering from skin disease called mange. Though she wouldn’t disturb anyone, people didn’t miss out a chance to throw stone at her. Many thought she was nuisance in the community we live in. When I decided to adopt her, I thought, I am helping her in life but it was other way around, she helped me in many ways, I was leading a life without a proper navigation and she taught me to be a survivor in life. We tried for good 7 years to get hold of her and get her treated for her skin disease but she never fell in our traps and she was hell bent to spend her life with her skin problem. All she had was 2-3 dog lovers to support her, whereas entire community was finding all possible ways to get rid of her from our community streets. I don’t know how many days I spent in last 7 years fighting for her survival but in whole process of fighting for her, I learnt how to fight for myself in this mean world and survive too. She was judged by people because of her ugly looks, I was judged by society because of how my life turned out to be. We both were being abused by society for none of our mistakes. Every time, I fought for her with people, it was moments of impacts. Few people with ugly hearts, once collected 200 signature for a petition to put her down. I, along with another animal lover fought those 200 signatures and we made sure, she lives among us in the community. After that, we started educating the kids who play on the streets about how to co-exist with animals and also explained that her skin disease is not contagious. Kids are fast learners and to our surprise, they understood the mantra-‘live and let live’. Over the years, people also started ignoring her presence. Few people, just wanted to avoid legal hassles we would cause for harming Mangie and few people, simply started respecting what we do to her and stepped out of our path. Throughout her life journey, Mangie taught me, how to fight back (Forgot to mention, she never spared anyone who tried to harm her for no reason) and at the same time, she taught another animal lover who was suffering from severe case of eczema to accept her skin the way it is and to be confident with her skin. Mangie made an impact in two women’s life and taught both of us a valuable lessons of life. In whole process of helping her, we helped ourselves to accept the life, the way it is and survive in this mean world without letting our self-respect down. 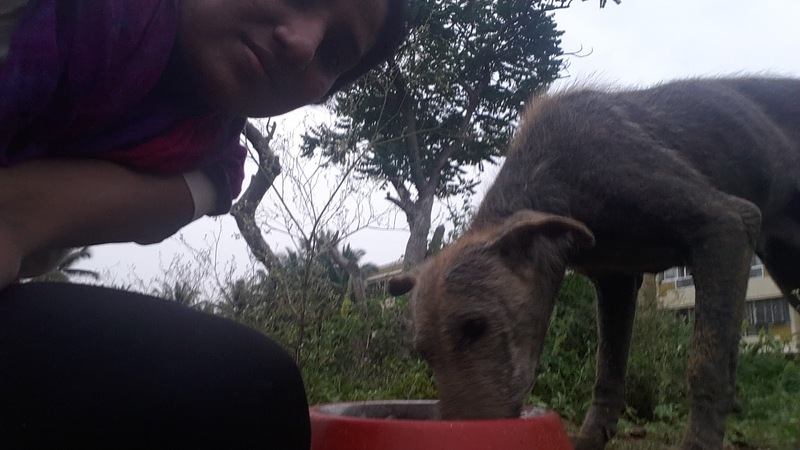 We wanted to get her treated for her condition but we never got successful in that, this taught us another lesson- be it animal or human, we can only help those who wants to be helped. After 7 years of our struggle to keep her alive in our community streets, one day we had to put her down, as she was restless and trying to bite anything and everything on the road. People suspected it was rabies. After consulting vets, we had to make the most heart breaking decision of our life. We sat next to her while she made her way to heaven, and cried our heart out for her. 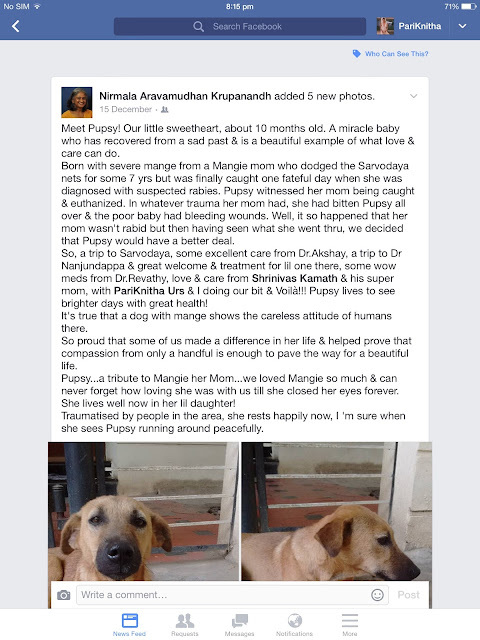 By then she had few months old female puppy whom we now call ‘Pupsy’. It was heart wrenching scene to let Pupsy watch her mother die. Unfortunately, Pupsy also born with same skin condition as her mother. 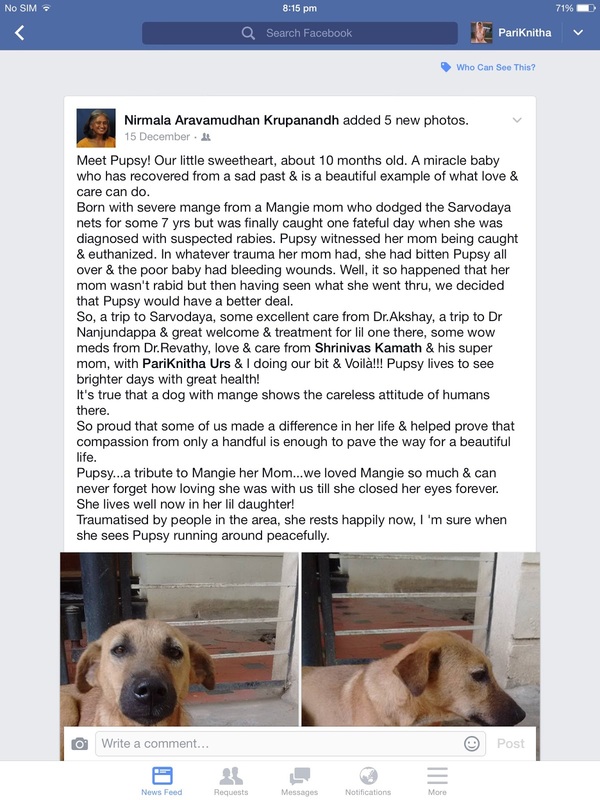 As we were burying Mangie, We both ladies decided not to let Pupsy also lead the same life as her mom and, to get her treated before it goes out of our hands. After several trips to vet and regular medication, now a pupsy is cute little girl and we see Mangie in her every day. I feel content and proud that, I made a bit of contribution for Pupsy's peppy life. Do not judge people based on skin, colour, looks or the way their life is. Being little compassionate towards fellow human being or animals can make great impact in lives of sufferers. If you can’t help, at least do not judge anybody’s life without knowing their over deal and don’t contribute to their sufferings. Little love and little compassion can make huge difference in someone’s life and can create little fantastico moments. Live and let live. PS- All the above images are truly mine. Such a beautiful post. Never read something like this before. Wonderful job. I loved it. Beautiful Posts, Actually I also love dogs. They are really beautiful. Such a touching one. Kindness at its best, I would say!